For those who follow American politics, Friday 24 March 2017 was a watershed day. President Donald Trump and the Republican majority house failed to amass enough support (218 minima despite having 247 seats [of the 435 total] in The House of Representatives) to overturn Obamacare and pass the American Health Care Act (AHCA) - and thus they 'pulled' the bill and did not take a vote. 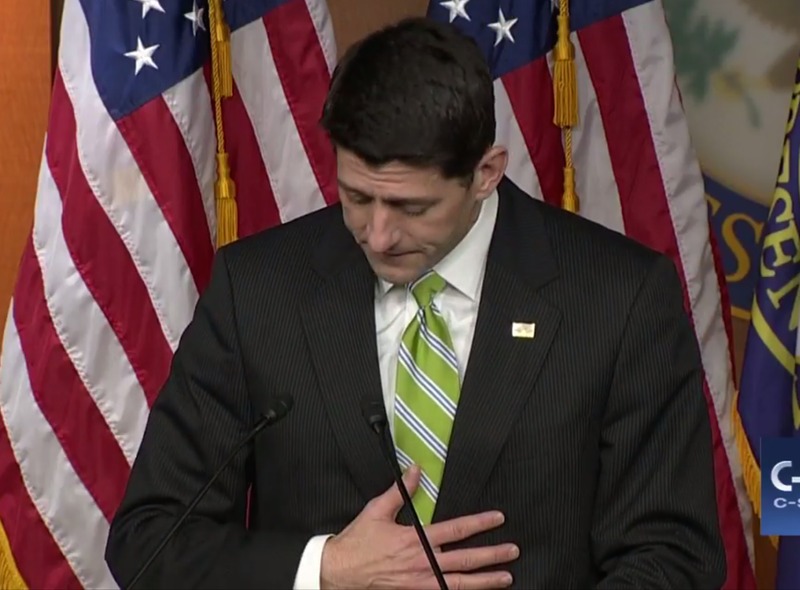 The Speaker of the House of Representatives, Paul Ryan (R-WI), gave a short 'concession speech' of sorts, which is included in the above video. 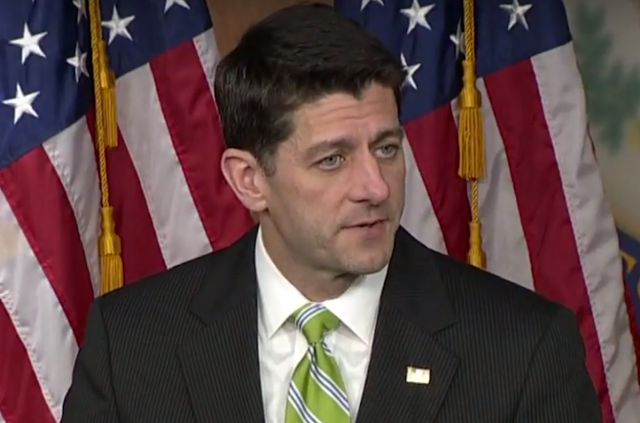 With regards to his body language, Paul Ryan's speech contained a plethora of nonverbal teaching examples - a portion of which are discussed in this article. In the included video, Mr. Ryan displays intertwined fingers beginning at 0:05 until 0:21, while saying, "Moving from an opposition party to a governing party comes with growing pains. And, well, we're feeling those growing pains today. We came really close today but we came up short". Although sometimes correlated with anger or a posed (feigned) attempt at appearing authoritative, the majority of the time, intertwined fingers are indicative of frustration (This image was taken from a different camera, showing a forward angle, affording us a superior view). 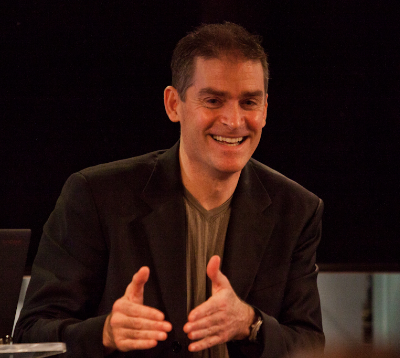 As with all nonverbal displays, it's crucial to never assess a body language signal in isolation, but rather as a word (or phrase) within the complete nonverbal sentence (cluster). 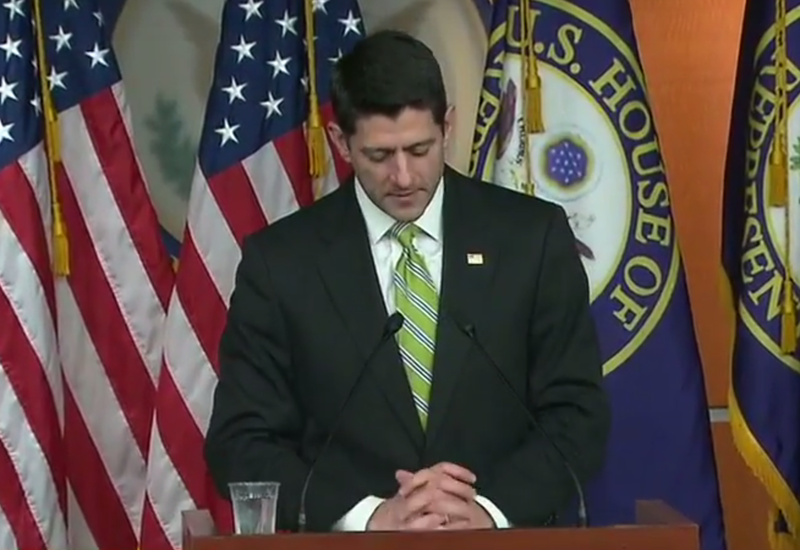 At 0:17, just after he says, "...We came really close today but we came up short", Speaker Ryan disengages his intertwined fingers and immediately displays a Nose Rub. In this context, this nonverbal MAP (Manipulator, Adaptor, Pacifier) is highly suggestive of Paul Ryan being deceptive when he referred to "We came really close". Indeed, this is supported by the fact that most reports indicate as the hour of reckoning approached, the number of Republicans who were committed to voting for the American Health Care Act of 2017 (AHCA) was diminishing, not increasing. Paul Ryan then displays a classic Unilateral Shoulder Shrug (with his Right Shoulder) at 0:23 just as he says, "bill" in the sentence, "I told him that the best thing I think to do is to pull this bill and he agreed with that decision". This is but one of many examples of what is termed a 'Partial Emblematic Slip'. The nomenclature 'Partial' comes from that it's Unilateral manifested - in contrast to fully expressed shrugs which are expressed bilaterally. The term 'Emblem' is a word given to describe the accepted and widely recognized meaning within a subculture, country, or geographic region (which is occasionally even Universal/Worldwide). It's a 'Slip' because he didn't intend to do display the emotion with which a shrug is indicative - that of: "I Don't know", "I Don't care", "What Does it matter? 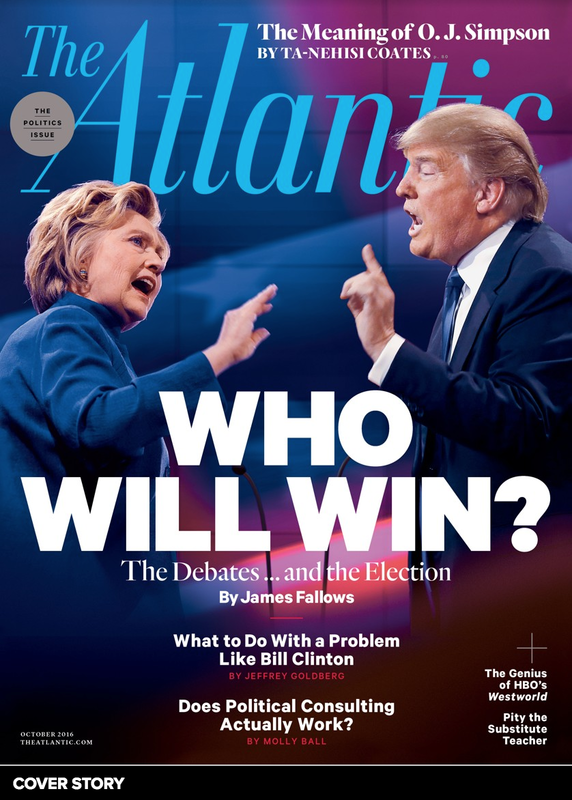 ", and/or "What Choice Did I have". His emotion leaked out despite his desire to sequester it. During 0:33 - 0:34, just as he says, "I will not sugarcoat this, this is a disappointing day for us. Doing big things is hard. All of us. All of us, myself included ...", Speaker Ryan touches himself with the full palmar side of his hand (all five digits and with the palm of his right [dominant] hand). The full palmar contact connotes sincerity - yet this is not strictly "heartfelt" sincerity - for he touches his upper abdomen - over his stomach rather than over his heart. Thus, while his feelings are indeed sincere - his emotions are here slanted much more toward anxiety, rather than for empathy-sadness associated with a loss. Just after he says. "I'm really proud of the bill that we produced" - during 1:23 - Mr. Ryan displays an "Inward Lip Roll" (ILR). An inward lip roll is a signal of our subconscious trying to suppress the inward growth - as well as the outward expression of strong emotions. Although an ILR is not emotion-specific (e.g., it can be seen with sadness, anger, joy, frustration, etc. ), if we wait only one second we find the feeling his psyche was trying to keep from growing. At 1:24 we see a Tongue Jut (and crucially, a Loose Tongue Jut) just a second after the above noted Inward Lip Roll. 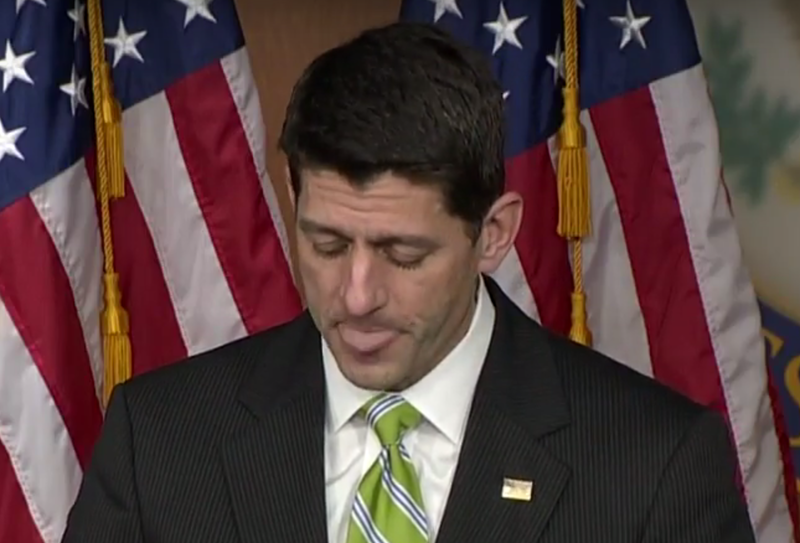 A loose tongue just is Ryan's body language saying, 'I've been/about to be bad' or 'I got caught' (Navarro). 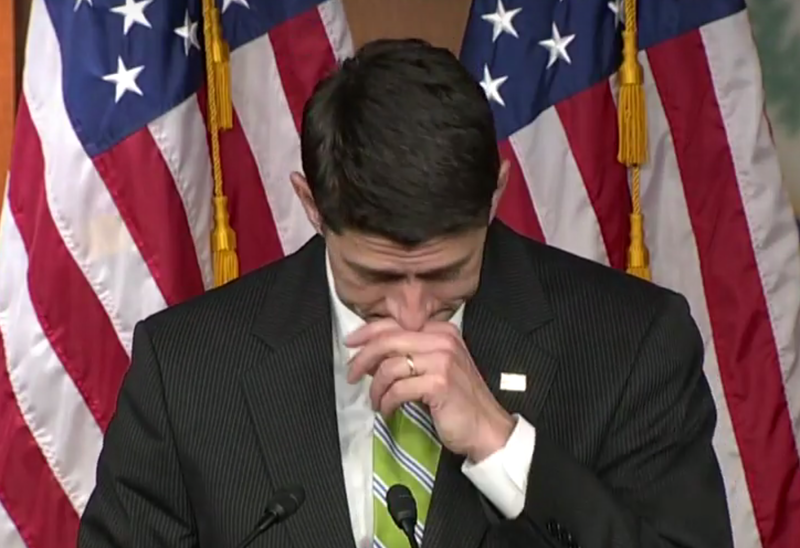 Therefore this indicates the strong emotion Ryan was suppressing with the inward lip roll was deceptive in nature (in reference to his statement, "I'm really proud of the bill that we produced". Ryan was NOT proud of the bill. 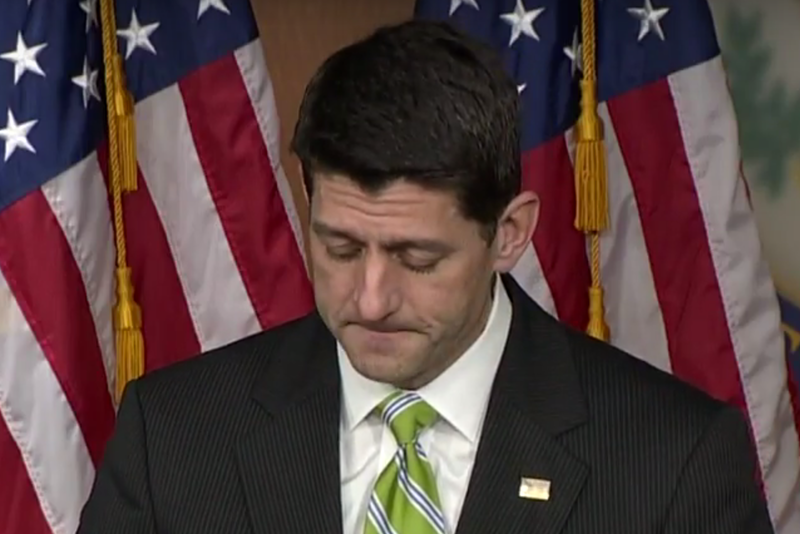 In this last image, taken during 1:35 just after Speaker Ryan says, "...And what's probably most troubling is the worst is yet to come with Obamacare". 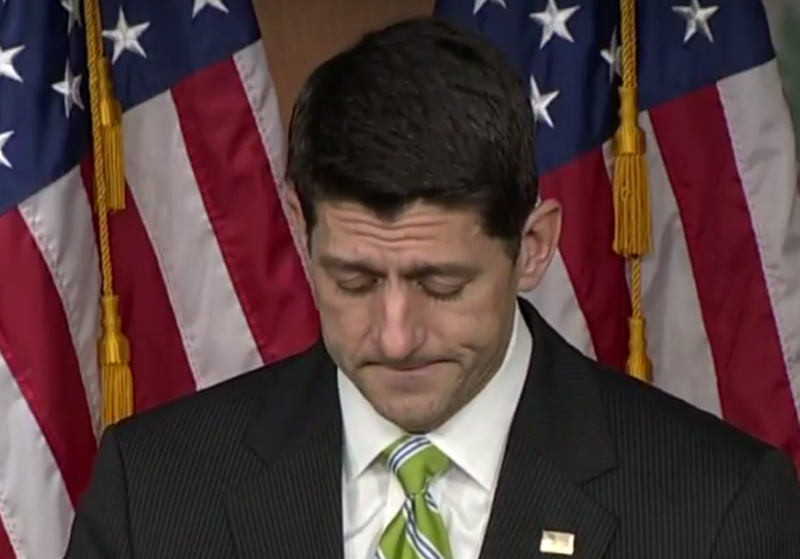 This lateral vectoring of the left corner of his mouth indicates Ryan's sincere feelings of in this moment are those of regret.